@la_photographic this is by way of an apology. I was looking forward to trying the get-pushed but I am so busy with the new Creative Team that I just couldn't get to it and then I was feeling a little poorly early today. Must better this evening but I am dropping out of Get-Pushed just don't have the time. @la_photographic these are for you. They're lovely- I hope Laura likes them. I know she'll understand how busy life can be. Pretty! These are so bright and cheery - love seeing them in the house. Beautiful shot Joan, hope you are feeling better now. Lovely shot. Are you enjoying being on Creating Team though? @30pics4jackiesdiamond I love it so much. Ponder yourself, be better soonest. lovely little crystal jug, looks like an heirloom. 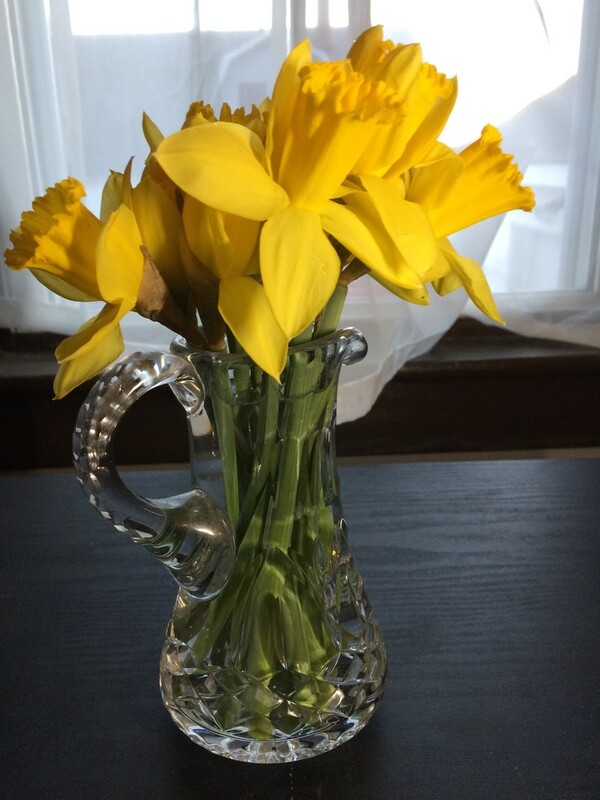 A pretty vase of daffs for Spring. Lovely vase, like the refractions in it! This does look like the beginning of spring - delightful.